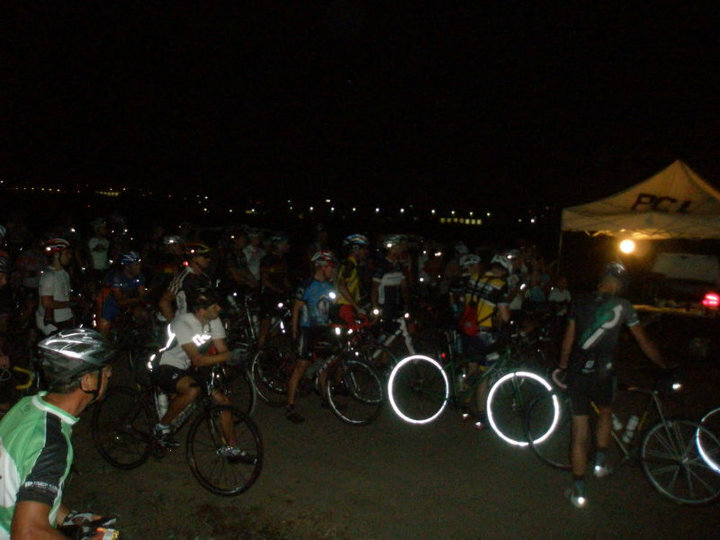 Some pictures stolen from Pirate Cycling League. I left Kansas City Friday night with hopes of getting to the start (were I would sleep in the back of the truck ) in time to get a reasonable amount of sleep. I got to Lincoln no problems, with the exception of a driving rain storm that washed all the lube off my chain. 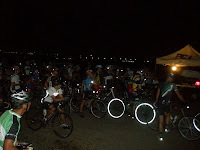 When I got to the start I was glad to see I wasn't going to be the only one sleeping out there. I would share the lot with Dennis from Iowa and another random I never met. The night was beautiful and I thought a good night of sleep wasn't going to be a problem, at least until the mosquitoes feasting upon my flesh. I ended up having to roll up all the windows which kept the bugs off me, but it turned the truck into a sauna. Start of the race was at 6 A.M, and somehow I was late (how are you late when you sleep at the start?). I rolled out just shy of dead last. At this hour of the morning it was still pretty dark all I could see is blinky lights way up the road. As it got lighter the fog rising from th e corn fields provided some of the most beautiful scenes of sunrise. At one point the road ahead completely disappeared as it dropped into a particularly foggy cloud. 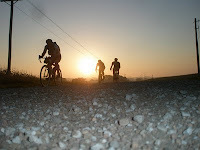 By the time the sun had completely risen I had made my up to what I think was the first or maybe the second chase group, about 15 riders. In the pace line the guy in front of me, who wasn't wearing a helmet, touched wheels with guy in front of him and went down. I was able to swerve and keep myself upright as well as keep my crank from hitting his head. Missing literally by two or three inches. It scared the hell out of me!! I was subsequently dropped by this group about five miles from the first check point. At the checkpoint I refilled my water bottles, bought my power ball ticket (proof you had been there). 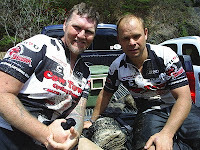 I rode out of checkpoint one with Matt Gersib, who had suffered a nasty crash himself, and another Lincolnite. They kept a brisk pace and within a few miles they had rode off from me. From check point one to two was mostly hilly B roads through some beautiful country. I managed to catch a rider who was part of the group that dropped me earlier on. We rode together for awhile he told me he had just move to Lincoln and had only heard of the race the night before. I rode off from him and spent the rest of the stage alone. Walking into the second checkpoint I managed to grab the last two frozen White Castle burgers, as well as some ice water and a power ball ticket. Standing outside the general store I gloated about having just scored the last two WC burgers, surprisingly no one seemed too care. I yucked it up with a few riders then headed out with a guy from Lincoln who's name I never caught, even though we were riding matching Salsa La Cruzes. We kept a decent pace the next ten miles to the fist oasis, which were optional stops to refill and cool off. Our stop was relatively quick and we rode off with another Lincoln rider, Janna Vavra the eventual women's SS winner. The three of us road together from a while with Janna doing most of the pulling. By the time we reached checkpoint three it was just Janna and myself, we would go on to finish the race together. As we left checkpoint three we continued to keep a decent pace by keeping our spirits up and minds distracted with light conversation. 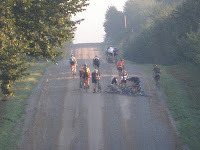 Soon we were coming across riders that were starting to break down, One guy from Lawrence looking for the short way back to Lincoln, another who was off his bike layed out on his back in the middle of the road. Then a few guys from the group that dropped me back before checkpoint one. After picking off a few more riders we caught Gersib, who had dropped me about a hundred miles earlier. Mora le was high at this point, but energy was dropping. Janna dragged me to the last oasis just ten miles from the finish. 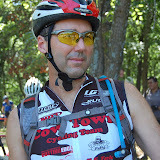 There I was able to cool off and rest enough to feel able to muster up the energy to ride ten more miles to the finish. Leaving the oasis we picked up another Lincoln rider, Malcolm Tassi who I had met at the farmhouse classic. I was truly impressed by this guy, he was seven beers and a hundred plus miles into the day and was packing two cold bottles of beer in his jersey pocket (I think he was worried there wouldn't be any at the finish). We pulled into the finish with a time of 11:56. It was a good day of gravel riding with a lot of good people, now the challenge of driving three hours home without falling asleep at the wheel. Round #7 Kenda NUE (National Ultra Endurance) Series rolled into Dahlonega, GA for what was planned a 100 mile romp on some sweet Georgia single track. Mother nature had other plans and the Fool's Gold 100 turned into a mud slinging classic. Our southern division of Cow Town were on hand with Joey Locke and Selby Holler taking on the elements and had to use all the MX mud experience to survive the day. A high attrition rate was recorded, but both Joey and Selby finished strong - neither with brakes, but a hell of a smile on their faces. 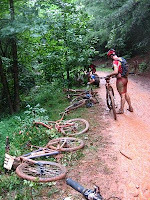 As you can see by the photo on the right, the "fool's gold" took its toll on bikes and brakes. Fool's Gold is shiny, like real gold, however, unlike real gold, fool's gold (pyrites or mica) is known for its crystalline structure, which makes it usually glittery. 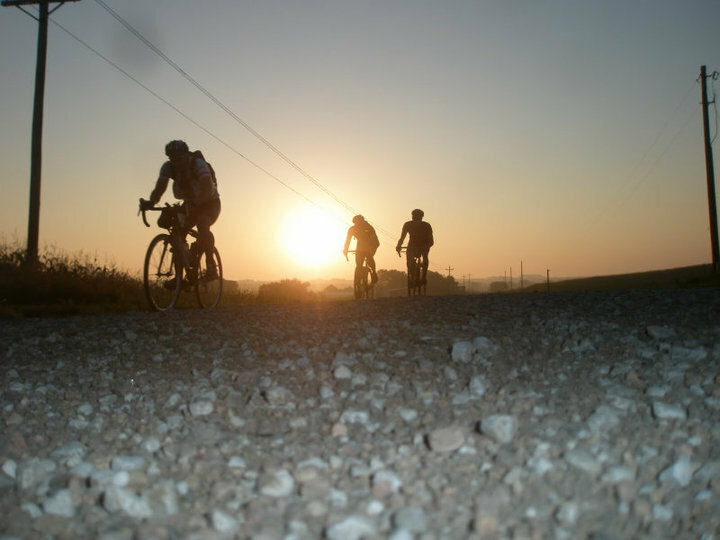 Mountain bike racers often notice the shiny mica on their bodies after a race, but at round seven of the National Ultra Endurance (NUE) series, they experienced just how abrasive these little metal flakes can be. 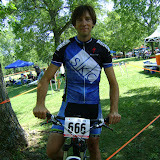 Some good race reports at Greg Rides Trails, I'd Rather Be Mountain Biking, Single Track, DC/MTB and Cycling News. Selby finished in 42nd place in 7:34 and Joey finished in 99th place in a time of 9:54. Just to finish the event was an accomplishment. I think both are now addicted to endurance racing and have plans to attend some other NUE events and the BURN 24 next year. Maybe we can get them to come up for next years Bone Bender 3/6 Hour MTB Odyssey? Cow Town was out in force today at the annual Rapture in Misery. A great showing with several podium finishes and even a win. Doug Long and crew did a great job with the course and providing a venue that we look forward to coming back every year. Now if he could only do something about the heat. Maybe move RIM back to September???? I vote yes. A hot day, but a very cool course greeted all the riders at the annual Crocodile Rock MTB race. Lyle Riedy did a fantastic job with the event and everything ran smoothly. Plenty of shade to keep you cool along with some cold beer to quench your thirst. Cow Town was out in force today with some great results. Tim Greene stepped up on the podium for the first time in the Marathon class, John Wagner took another win in the Single Speed class, Jeff Arnaud and Craig Myers-Areth battled it out in the Sport 30-39 division, Chris Locke and Mike Classen represented the team in the Expert classes.